Hours: Monday through Friday, 9:00 A.M. to 5:00 P.M. excluding holidays. 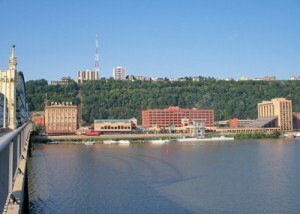 The offices of PHLF and its subsidiaries are located on the Fourth floor of The Landmarks Building (P&LERR and Grand Concourse Signs) at Station Square. Enter the building from the ground level at the Grand Concourse Restaurant. Once in the restaurant lobby, walk to the guard’s desk. Sign in and the guard will unlock the double door. Take the elevator to the 4th floor. If the guard is not there, use the intercom on the wall. Scroll down to “PHLF”, press “Call”, and our receptionist will ring you in. PHLF welcomes your comments and suggestions on our programs and services. We regret that we cannot respond to e-mail requests for research to be conducted by staff without prior arrangement. 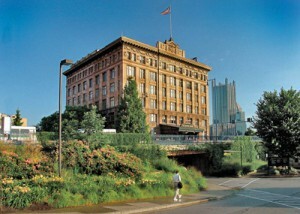 The staff is available to do minimal research on historic buildings in Allegheny County by scheduled appointment. Members of PHLF are entitled to an hour of staff research at no charge; additional time will be charged at $30 per hour. Non-members of PHLF will be charged $40 per hour for any research work. Should you wish to schedule staff research time, please contact Frank Stroker at 412-471-5808. Access to PHLF’s library and archives is available to members at no charge, but any library research must be scheduled through PHLF’s Director of Historic Resources and Collections during normal business hours of Monday through Friday, 9:00 a.m. to 5:00 p.m.